From these details, it is crystal clear that out of these eleven most polluted cities in the world, five cities are in India: Gwalior, Allahabad, Patna, Raipur, and Delhi. Regarding PM10 level, the highest polluted city in the world was Orvishta (Nigeria) with annual mean of 594 micrograms per cubic meter followed by Peshawar (Pakistan) of 540 microgram per cubic meter. Gwalior with 329 micrograms per cubic metre ranks tenth in the 10 highest PM 10 level cities (and is the only Indian city among top ten highest PM 10 level). In this regard, Delhi ranks 25th position with 229 microgram per cubic metre (annual average). In addition, WHO's 2016 report clearly mentions that urban air pollution levels were lowest in high income countries ( Europe, Americas and Western Pacific region); on the other hand, highest urban air pollution levels were experienced in low and middle income countries, especially eastern Mediterranean & South East Asia regions, exceeding 5-10 times WHO safe limits. Unfortunately now-a-days in central Delhi (Lodhi Road and India Gate) one smallest, finest and deadliest pollutant has emerged-PM1 that is 70 times finer than the thickness of a human hair. 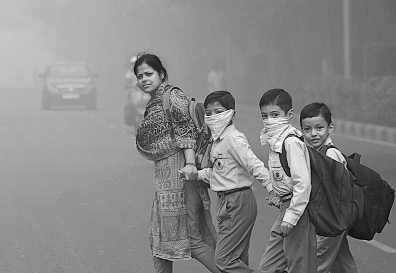 At Lodhi Road (New Delhi) SAFAR (Ministry of Earth Sciences) recorded in July 2017 average volume of PM 1 during summer, winter and monsoon at 46, 49 and 20 microgram per cubic metre respectively. In 2006 in Delhi particulate matter (PM10) was 153 microgram per cubic metre (annual average) that increased to 214 in 2008 and to 261 in 2010 (due to major construction works for Commonwealth Games) which declined to 222 in 2011 but again peaked to 260 in 2016. In 2017 the air pollution in Delhi, increased eight times plus the good level (upto 50 microgram per m3) in most of Delhi, as is clear from Table 2. It goes directly into bloodstream causing serious heart problems. WHO has not defined a safe limit for PM 1, though the same for PM 2.5 is 60 micrograms per cubic metre and for PM 10 is 100 micrograms per cubic metre. As per WHO estimate about 3.3 million people die annually in the world form pollution by these particulate matters. Various studies have pointed out different causes of Air Pollution, especially in Delhi: Some of findings of some studies are presented in tabular form (Table3). NOX and CO came from vehicles. Main Findings- a) Road dust as the biggest contributor 52.5% to particulate matter in Delhi's Air, industries 22%,vehicles particulate emissions, 6.6%. b) Vehicle & industry sources as dominant sources of PM 2.5, followed by construction. Main Findings- a)Heavy commercial vehicles as major source of particulate matter (92%) followed by two wheelers. "Further thermal power plants (Badarpur) too contributes substanthally to air pollution in Delhi. However, if we look at the national scene we find that thermal power plants (mainly coal) are a significant source of carbon emission besides vehicles, firewood, burning of solid waste as well as construction works. In total 68% of India's total electricity power comes from thermal power plants(194200 MW), owned by states or centre or private firms/Joint ventures: Maharashtra (28294 MW) has the largest thermal capacity, followed by Gujarat (23160 MW), Chhattisgarh (13234 MW), U.P. (12228 MW), Tamil Nadu (11513 MW), MP(11411 MW), and Rajasthan (10226 MW). a)Emission from coal-fired thermal power plants-13 thermal power plants within 300 km radius of Delhi emit secondary particles contributing 30% of PM 2.5 in winter and 15% in summer. b)There are more than one crore vehicles in Delhi-since 2000 vehicles in Delhi increased by 97%, particulate matter by 75% and NOX by 30%; in winter vehicles contribute 20-25% to particulate matter and 6-9% in summer; in Delhi from vehicles, 217.7 tons of carbon monooxide, 84 tons of NOX, 66.7 tons of hydrocarbon and 0.72 tons of sulpher dioxide are emitted daily and 9.7 tons particulate matter daily; More than half of vehicles in Delhi do not have pollution certificates, there are 50 lakh vehicles on roads in Delhi daily but no adequate staff to check. c)Burning of crops stems (Parali)-Punjab 19.6 million tons, U.P. 21.9 million tons and Haryana 9.1 million tons annually - contributes 140 micrograms per cubic metre PM 10 and 120 microgram per cubic metre PM 2.5; on October 22, 2017, at least 2334 instances of crop stems' burning were recorded by NASA in north India. Therefore air quality on 6 and 7 November 2017 deteriorated in Delhi & NCR: PM 2.5 concentration reaching to 1000 micron per cubic metre at Delhi Technological University (against the average of 529), 971 at Sirifort (against average of 333), 976 at Ghaziabad (against the average of 432), 894 at Punjabi Bagh (against the average of 355), 865 at Noida (against average of 353), 862 at Anand Vihar (against average of 309), and 819 at Mandir Marg. (against average of 819),-thus 16 to 20 times the normal quality of air. New studies have found that even kitchens may also be as polluted as outdoor, PM 2.5 emission reaching upto 310 microgram per cubic metre during summer (Pallavi Pant, Times of India, 4 April, 2017). Actually frying and grilling generate ultrafine particles that are quite harmful. Due to use of fossil fuel burning for cooking (3.22 lakh house holds use it) air pollution, especially PM 2.5 level, increases 12% in Delhi (The Hindu, 30 December 2015). In rural areas more than two thirds families use fossil fuel for cooking, light, mosquito-repellance, fertilisers etc. It is a contradiction that only 77% of households don't have electricity connection while 99.5% of villages have been electrified- because a village is considered electrified if 10% of its households have electric connection. Jharkhand, Nagaland, Bihar, U.P, & Assam have highest proportion of households without power. GOI has planned to give power connection to 4.10 crore households without power in rural areas by December 2018. In 2014 electricity consumption in Russia (coldest area) was 6603 KWH per capita against 6353 in Europe, 4229 in South Africa, 3927 in China, 2601 in Brazil and Just 806 in India. Needless to say that per capital consumption of power indicates the degree of industrialisation and quality of life. (The author is a Senior Bureaucrat.) Views expressed are personal.